A recording purportedly made by the mastermind of bombings and beheadings in Iraq threatened to assassinate Iraq's interim prime minister and fight the Americans "until Islamic rule is back on Earth." The audio, found Wednesday on an Islamic Web site, is supposedly from Abu Musab al-Zarqawi, the same Jordanian-born terrorist whose group claimed responsibility for the beheading of American hostage Nicholas Berg and Kim Sun-il, a South Korean whose decapitated body was found Tuesday evening between Baghdad and Fallujah. 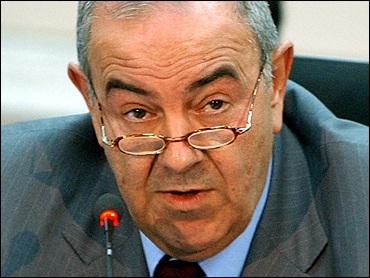 A spokesman for the interim prime minister downplayed the death threat to Iyad Allawi, saying it's not the first time al Zarqawi has threatened Iraq and that the "path to democracy and freedom will not be stopped," reports CBS News' Charles D'Agata. In the audiotape, the speaker thought to be al-Zarqawi told Allawi, that "we will continue the game with you until the end." The speaker said "we will not get bored" until "we make you drink from the same glass" as Izzadine Saleem, the Iraqi Governing Council president killed last month in a car-bombing claimed by al-Zarqawi's group. A roadside bomb exploded near Baghdad's Kindi Hospital on Wednesday, killing a policeman who was handling the bomb and a mother and her child who were riding in a taxi, Iraqi police said. A roadside bomb also exploded as an Iraqi National Guard patrol passed in the northern city of Mosul, killing one Iraqi soldier and wounding four others, the U.S. military said. Deputy Defense Secretary Paul Wolfowitz Tuesday told a House panel that it is "entirely possible" U.S. troops will be in Iraq for years. He denied Congressman Ike Skelton's contention that U.S. troops are "stuck" in Iraq. The international Red Cross is pressing U.S. authorities to release three letters sent by Saddam Hussein in detention to his family. Iraqi engineers said they had resumed pumping crude oil through an export pipeline between northern Iraq and Turkey that was attacked last month. Officials with the State Oil Marketing Organization said they were unaware the pipeline was back up. Top followers of radical Shiite cleric Muqtada al-Sadr rejected an invitation to join a national conference that will select a council to advise Iraq's interim government. The Bush administration laid out its legal reasoning for denying terror war suspects the protections of international humanitarian law but immediately repudiated a key memo arguing that torture might be justified in the fight against al Qaeda. Iran released eight British sailors it had detained for illegally entering Iranian waters, but said Wednesday it was keeping their three military patrol boats. South Koreans reacted with sorrow and anger to Kim's beheading Wednesday, with President Roh Moo-hyun calling it a "crime against humanity." The beheading of Kim, 33, who worked for a South Korean company providing supplies to U.S. forces, prompted the Seoul government to order all nonessential civilians to leave Iraq as soon as possible. Kim's body was found two days after he appeared on a videotape broadcast by Al-Jazeera television, pleading "I don't want to die" and begging his government to pull its soldiers out of Iraq. South Korea refused and said it would go ahead with plans to send another 3,000 forces here by August, which will make it the third-largest troop contributor after the United States and Britain. "When we think of his desperate appeals for life, our hearts are wrenched with grief," Roh said Wednesday in a national television address. After the slaying of Kim, U.S. forces launched an airstrike on what the Americans said was an al-Zarqawi hideout in Fallujah. Three people were killed and nine wounded, said Dr. Loai Ali Zeidan at Fallujah Hospital. It was the second U.S. airstrike on Fallujah since Saturday. "In both cases we believe we hit significant numbers of al-Zarqawi lieutenants and al-Zarqawi fighters," said Brig. Gen. Mark Kimmitt, the coalition's deputy operations chief. The airstrikes also destroyed large ammunition stores, Kimmitt said Wednesday in an interview with Associated Press Television News. The grisly killing of Kim comes amid a rash of violence showing no signs of letting up as the June 30 date for handing over sovereignty approaches. John D. Negroponte, the new U.S. ambassador to Iraq, said Wednesday the situation in the troubled country won't be turned around overnight when sovereignty is handed over, but "it's possible to get the trend moving in the right direction." Sen. Joe Biden, D-Del., who visited Baghdad last week, told the CBS News Early Show "My primary concern is this is a starting point not a turning point and we'll look to this as if somehow we've equipped the Iraqis to be able to handle more than they can." "This is a very tough situation. It's going to be a tough transition. We cannot afford to lose it," said Sen. John McCain, R-Ariz. "Our biggest mistake was that we didn't have sufficient troops there and underestimated the challenge post-combat phase and we're paying a very heavy price for it."